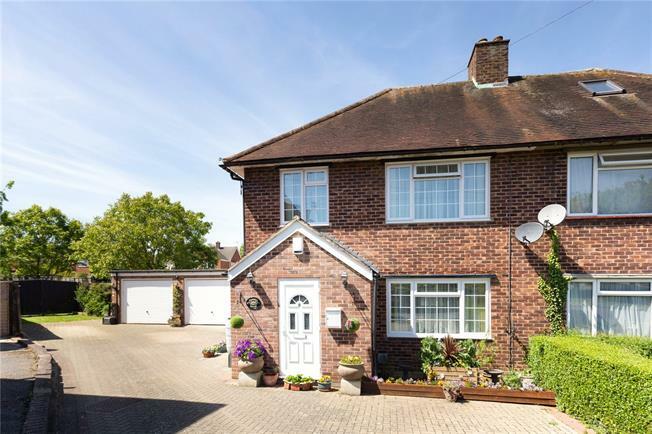 4 Bedroom Semi Detached House For Sale in Windsor for Guide Price £675,000. Tucked away in a cul-de-sac location, a 3 bedroom family home with a double garage, private parking for numerous cars and a larger than average garden. This property also includes a self contained one bedroom annexe and is offered to the market with no onward chain. Ground floor accommodation features a front aspect sitting room with the kitchen overlooking the rear. The dining room sits open plan to the kitchen providing an ideal family space. The kitchen is well appointed with white units with some integrated appliances including a dishwasher, microwave and oven, in addition to space for a range cooker, washing machine, dryer and fridge/freezer. Staircase leads to three bedrooms all with built in wardrobes and main family bathroom with white suite, bath with inset shower. Keepers Farm Close is approximately 2 miles to Windsor town centre and approx 5 miles to Maidenhead with the smaller villages of Oakley Green and Bray nearby. Windsor provides a comprehensive range of shopping facilities, Windsor Castle, the Long Walk, Eton and the River Thames. In addition, Windsor has excellent transport links with mainlines to London Waterloo and Paddington (via Slough), the M4 junction 6 giving access to Heathrow Airport, London, the M40 & M25 Motorways. An extensive range of schools are in the area, including St Georges, Queensmead, Lambrook School, Clares Court, and Highfield Prep in the Independent sector and Homer First School, Braywood CE, Oakfield and Hilltop First Schools, St Edwards, St Peters CE Middle Schools and Windsor Boys, Windsor Girls Schools and Holyport College in the State sector to name a few. The property is approached via a central green in Keepers Farm Close and block paved driveway providing parking for numerous cars leading to a double garage. Side gate leads to the rear garden which is laid mainly to lawn and wraps around the house and includes a pond, three sheds and a generous decked terrace accessed from the kitchen. A self contained one bedroom annexe with a separate entrance is integral to the house and can also be accessed internally via the kitchen. The annexe features a sitting room with French doors opening onto the garden, kitchen, bedroom and bathroom with walk in shower.